Wednesday was our last day at Station A before heading to station G. Half way through our third CTD of the day we were ambushed by a pod of common dolphins. The dolphins stayed around the boat for most of the morning and into the afternoon, with one theory being that they like the way the waves break around the ship. Aside from all that cetacean excitement some science also got squeezed in to the day’s events. Today was a day of trace elements, complete with their ultra-clean CTD, ultra-clean labs and ultra-tired scientists! For some background to the marine study of Iron, including why we are looking for it and why it is so hard to measure, there is an excellent summary written for this blog by Jonathan Sharples during one of the previous cruises – see post titled ‘Sampling Iron’ written on 15th November! Trace metal scientists at work in their ultra-clean lab. As mentioned in Jonathan’s blog post we believe that one major source of Iron is resuspension from sediments on the continental shelf. 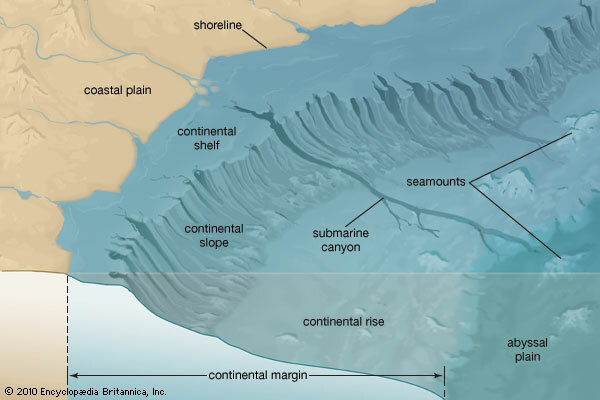 The edge of the continental shelf can be thought of as similar to a vast desert on the edge of a gigantic cliff face, with the water depth increasing from just a few hundred metres to distances measured in kilometres as you move from the shelf edge towards the open ocean. The broad, gentle pitch of the continental shelf gives way to the relatively steep continental slope. Currents and waves cause particles of sand and mud on the sea floor to be lifted off the seabed and mixed into the water column above, and these can then be transported off the shelf edge in giant plumes of resuspended particles. The last cruise found evidence of currents along the sea floor of the continental slope which were pulling sediment off the seabed and causing it to mix in the water column above. On this cruise one thing we are measuring is the concentration of Iron in the shelf sediments, which can be compared to Iron concentrations in sea water above to work out how much Iron the sediment is supplying the water column each year. As phytoplankton growth (and thus, primary productivity) is limited by Iron in 25% of the open ocean, a better understanding of the processes which supply Iron to ocean waters is important to understand how primary productivity in the open may change in response to climate change. man in a hard hat pointing at the location of Site A.